For more than 35 years, Currier Plastics, Inc. of Auburn, New York has provided countless customers with custom molding solutions that deliver the products people depend on to be safe and secure. Currier Plastics uses advanced equipment, statistical analysis and precise traceability of products with a strict performance standard of zero defects in their blow and injection molding processes. Their processes are efficient while cutting costs without compromising the reputation of their customers. Efficiencies can be acquired in a variety of ways and Currier Plastics understands the importance of specifying equipment and machinery that is reliable and maintenance-free. With an emphasis on innovative technology and automation, Currier is able to increase efficiencies while providing consistency and quality of products. For example, in the process of manufacturing bottles, Currier Plastics utilizes belt conveyors to move the moils and tails away from their extrusion blow molding machines. Two conveyors are paired together; one conveyor is used to get the moils and tails out from under the molding machine and the other conveyor feeds them into a grinder. According to Sean Plantz, Maintenance Technician for Currier Plastics, the two belt conveyor system is Currier’s standard way of removing the moils and tails from the process of blow molding bottles as they are trimmed or deflashed. Currier Plastics recognizes the benefits of automation, including the use of conveyors, in the blow molding process. But, Plantz was discouraged with the long lead times required from their conveyor vendor for replacement parts and the lengthy repair process to change an endless belt. He was frustrated with the overall constant care required to ensure that the conveyors were operating properly. Currier Plastics learned about DynaCon plastic modular belt conveyors from other molding companies in the industry and decided to give them a try. They started by installing one 16’ long conveyor with a 45 degree angle under the molding machine for getting the moils and tails out from under the machine. “Because of the design of the DynaCon conveyors, we do not have to constantly stop to make sure parts aren’t getting wedged in the conveyor drives,” said Plantz. Because of this success, after just a few months of use, they added a second angle conveyor to the process so they could feed directly to the grinder. The second plastic modular belt conveyor includes a metal detection unit that safeguards the grinder by inspecting the scrap for impurities such as ferrous, non-ferrous and stainless metals. Detection of these impurities prevents severe damage to the grinder blades and prevents unnecessary machine downtime and costly maintenance. 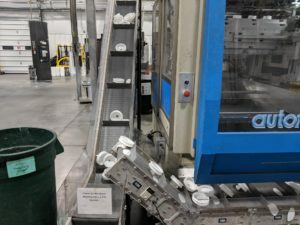 Since purchasing their first DynaCon conveyor, Currier Plastics has experienced increased efficiencies after updating their molding processes to include plastic modular belt conveyors. “We literally only work on the DynaCon conveyors when they are damaged by misuse. Otherwise, we do a regular cleaning, and put them back in production. It has been nice to not come into 3 or more conveyors needing repair every Monday,” explained Plantz. Currier recognizes that every time there is conveyor downtime due to an issue, they are losing efficiencies and valuable production time. “Conveyor downtime has pretty much been eliminated by using DynaCon conveyors,” said Plantz. The elimination of conveyor downtime aids in Currier Plastics goal to reduce customer costs without compromising part quality.